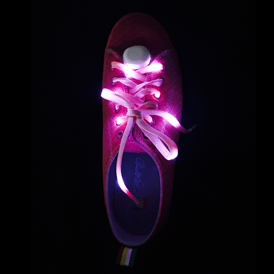 Be the light of the party when wearing these LED light up shoe laces. The 10 LEDs in each lace let everyone know you're on the move. Switch between 3 modesâ€”steady on, slow flash, and fast flash. 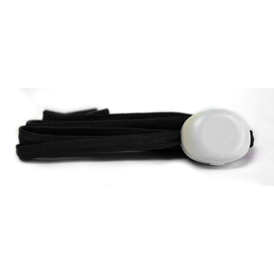 Great safety lights for runners, walkers, and kids before and after school dark hours. 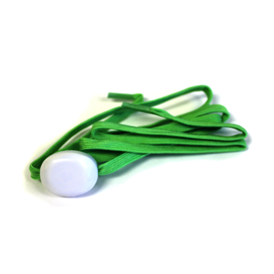 Choice of knit nylon in blue, white, black, or green. 1 PMS color imprint. Imprint area on module is 5/8" x 5/8". 10 ultra bright LEDs - 5 on each side of the module. Weatherproof, hand-washable (excluding the battery module). Lace length: 42" x 1/4" width. 3 weeks after approval of pre-pro sample or artwork. Shipping weight approximately 44 lbs per 500 pairs.